Participation condition: 10 years old or older. You can not use a mask that covers the entire face. It may change depending on the weather etc. Have your own nap and breakfast at the inn. There is an island in Tokyo with over 100 wild dolphins. Many snorkelers visit Miyake from all over Japan and from all over the world. During cruising to Mizojima, you may encounter various creatures such as whales, dolphins, sea turtles, sharks, flying fish and sea birds. Please read before making your reservation. ・You need to be able to swim well for activities in the open sea. 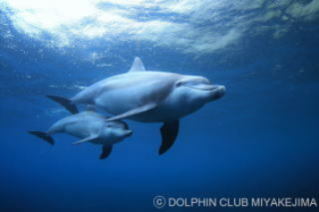 ・If you are participating in Dolphin Swim on Miyakejima for the first time, you need to participate in training. 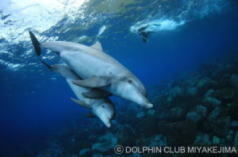 ・It is mandatory to wear a wet suit in Dolphin Swim conducted at Miyakejima. You can also rent it. ・Depending on the weather and sea conditions, tours may not be possible. ・Please comtact us in advance if you have chronic illness. ・It takes abut 40 minutes of one-way voyage by fishing bost to the sea near island where the dolphin's live. Someone who has enough snorkeling experience and can ensure his safety in the open sea. Or who participated in our training course. ・The sea where the dolphins live is around a large bay or an island without a cove. ・We try to swim in the shadows of the island as much as possible, but it may still be windy. I・n order to swim the dolphin safely and comfortably, we recommend preliminary practice. ・If you can swim smoothly, you can enjoy a lot more to swim with the dolphins. Also, if you swim with us in advance, we can guide you at ease. ・We apologize for the extra cost and time, but we recommend that you take part in advance practice. Seasickness preventive agent (It may be difficult to buy depending on store business day and time). If you have masks (underwater glasses), snorkels, fins (foot fins), wet suits, etc., it would be nice to bring something that you want to get used to.